The last fifteen years have been a period of dramatic change, both in the world at large and within the fields of ecology and conservation. The end of the Cold War, the dot-com boom and bust, the globalizing economy, and the attacks of September 11, among other events and trends, have reshaped our worldview and the political environmin which we find ourselves. At the same time, emerging knowledge, needs, and opportunities have led to a rapid evolution in our understanding of the scientific foundations and social context of conservation. Correction Lines is a new collection of essays from one of our mthoughtful and eloquwriters on conservation, putting these recchanges into perspective and exploring the questions they raise about the past, present, and future of the conservation movement. 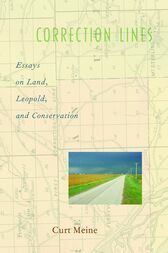 The essays explore interrelated themes: the relationship between biological and social dimensions; the historic tension between utilitarian and preservationist approaches; the integration of varied cultural perspectives; the enduring legacy of Aldo Leopold; the contrasts and continuities between conservation and environmentalism; the importance of political reform; and the need to "retool" conservation to address twentyfirst-century realities. Collectively the essays assert that we have reached a critical juncture in conservation-a "correction line" of sorts. Correction Lines argues that we need a more coherand comprehensive account of the past if we are to understand our prescircumstances and move forward under unprecedented conditions. Meine brings together a deep sense of history with powerful language and compelling imagery, yielding new insights into the origins and developmof contemporary conservation. Correction Lines will help us think more clearly about the forces that have changed, and are changing, conservation, and inspire us to address currrealities and future needs.